I don’t think there has ever been a time when being a woman was more difficult than it is today. We are being stretched in more directions than a rubber band. There is pressure on us from every direction and little in the way of relief coming in our near future. The best way to navigate through all of these different roles we are filling is by understanding and accepting ALL that we are. AS well as ALL we are NOT! It is perfectly okay NOT to be something and know it. Because no one person can be everything to everyone. YOU ARE STRONG- not because you can lift more weights at the gym than anyone else. Or even because you have been through more than most people. You are strong because you know where you are WEAK and accept that as an attribute instead of a flaw. 2) YOU ARE BEAUTIFUL- regardless of your outward appearance. Remember this, Roses are beautiful flowers with painful THORNS. Beauty is more than just looks. You are aware of your flaws,which is more than most people can say for themselves. 3) YOU ARE FEARLESS- this does mot mean that you are ready to go into battle by any stretch. But you are not afraid of learning. In fact you have learned reality from illusion. Something that takes some folks a lifetime to achieve. 4) YOU ARE WISE- NO you do not have to be old to be wise. There are many people of varying ages with an abundance of wisdom. Your wisdom is apparent in your ability to LEARN from the mistakes you have made! 5) YOU ARE A LOVER- You recognize what TRUE love is because you have either seen or felt HATE! Once you have had that experience it makes you cling to LOVE all the more. 6) YOU CAN LAUGH- usually those who can really enjoy happiness have lived through some very SAD times.They can appreciate the funny side of life more than those who have never known sadness at all!! I know I can relate to most of these. 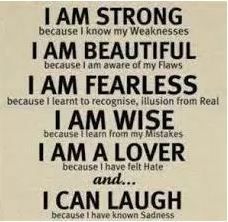 And in fact I have to remind myself often of these affirmations. It helps to keep me in balance on days when I might be feeling a little low. I invite you to use these in those times when you feel as though there is a rain cloud over your head! GOOD LUCK! !